My friend, Michael 8 (aka Michael Hill) of Septembryo, asked me to do something a little unusual. In addition to reviewing his album (forthcoming), he wanted me to review his new music video as well. 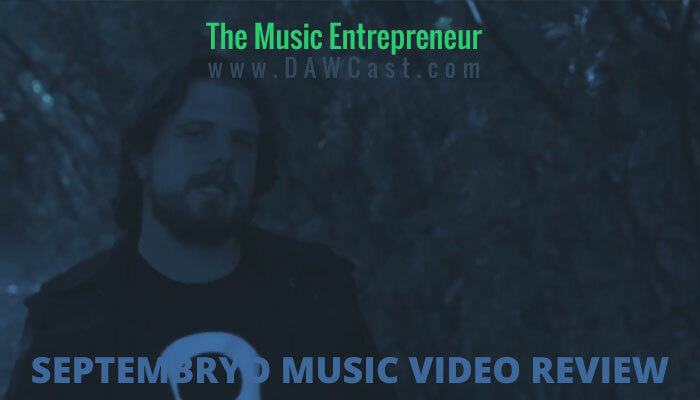 The video in question is for the self-titled track, “Septembryo”, which I’ve become intimately familiar with, because I’ve had the new Septembryo album on repeat while I’ve been working at home. Because I will be talking more about the music in the upcoming album review, I’ll try to steer clear of commenting on the musical side of things for now. With that out of the way, here are my thoughts on the “Septembryo” music video (which you can check out below). The quality of the video is high. In my opinion, this doesn’t necessarily add to, or take away from, the validity or appeal of a music video. However, Michael’s initiative was clearly to make sure his video wasn’t just lumped in with a myriad of other home-made, low-fi indie videos, and this gives it a chance at cutting through the noise. Good on him. In addition to that, I don’t sense any (or at least very little) of the amateur awkwardness many inexperienced artists tend to project while on camera. And this goes not just for Michael, but also for the others making an appearance in the video. If there’s anything else I could add here, it would be that the entire video has a blue filter on it. “Septembryo” was clearly shot during the day, but the video is supposed to have a little bit of a darker, eerier feel to it, so I can see why they did it. I don’t hate the effect, and it does seem the right artistic choice in this instance, but it doesn’t work in every situation. Even so, I have long said that The Matrix is my favorite movie, and it had a green filter on every shot taking place within The Matrix, so I guess I’m going to have to go easy on this too. Michael’s fascination with numbers, omens, and the world beyond are definitely on play here, and I am compelled to make comparisons to The X-Files, which I’m sure are welcome. And, further to the point, it seems like a fitting choice based on the lyrical content. Michael is a character all his own in this video, though exactly what character is the question. He could be real or in a dreamlike state, but either way, he’s a man in search of something. In the midst of that, we also have secret agents conducting their own investigation, presumably tracking down “The Kraken Queen”, who comes face to face with Michael at the end of the video. Speaking of the world beyond, it could be that the video is depicting different planes of reality and existence; one where the secret agents are trying to track down their lead, and one where Michael and the alien creature exist. Or maybe there’s a time gap between the two events. It could even be a commentary on the duplicity of human existence. It’s clearly open to interpretation and whatever meaning you derive from it. But without getting too intellectual, I will say this: this video engages you from the beginning and compels you to watch to the very end, because you want to find out what’s going to happen next. It’s like a condensed X-Files episode backed by passionate, melodic music. This being my first ever music video review, I’m not sure how well I did, or what I could have done better. I hope that I have done the video justice, and I’m not the least bit apologetic about plugging Septembryo, because the music is certainly deserving of more attention. What are your thoughts? What do you think this video is about? What did you think about the production and premise of “Septembryo”? (P.S. Talk about strange numbers… when I finished writing this post, the original word count came out to exactly 666).